There are many benefits to choosing a gas oven and range. Gas ovens are often less expensive to run than electric ones, as well as being very long lasting. However, they are still susceptible to failure, so you may find that your oven is not heating up as it should. It could be that it is failing to heat altogether, perhaps due a lack of flow in the gas supply, or a problem with the ignition. On the other hand, if your oven is heating unevenly or too slowly, there could be other underlying issues. Learning how to identify the problems that can prevent a gas oven from heating properly is very important. Some of the problems could indicate there is an issue requiring the assistance of a professional. A few issues could even suggest that there is a safety issue. However, some problems could be fixed yourself. Performing these jobs on your own, provided you are comfortable and confident in your abilities, could save you a great deal of money. The burner tube is a metal tube at the bottom of your oven. It has small holes through which the gas can flow, resulting in the small, evenly spread flames that heat your oven. If your oven is not heating properly, the burner tube may be corroded or damaged. Uneven heating could even indicate that some of the holes are blocked. To resolve this issue, you will need to remove the cover plate from the bottom of the oven in order to look at the burner tube. If there is evidence of corrosion, it will need to be replaced. If the holes are simply blocked, however, you should be able to clean them. The gas that runs to your oven needs to travel through a supply valve. If the valve is faulty, this can restrict the flow of gas and prevent the oven from heating. You need to open the oven door in order to see the burner tube when you light the oven. If you have a pilot light system, make sure it is lit. If you have an igniter, it might take a little time to heat up. If the pilot light and igniter are working, but there is no flame, it could indicate that there is no gas coming through the valve. Alternatively, there could be only a low flame, which may mean your valve is faulty. The valve should be replaced by a professional. Check for dirt on the igniter. Clean it gently using an old toothbrush. If your igniter normally makes a clicking sound when you use it, listen carefully when you try to light the oven. If there is no sound, it may be broken. If you usually see sparks when you light your oven, check to see if they are visible. Check the wiring connected to the igniter, taking the proper safety precautions at all times. It might be disconnected or loose. If your oven relies on a pilot light or glow bar, a malfunction can prevent the oven from heating. A glow bar system is controlled electronically. If you have a multimeter, you may be able to check whether the glow bar will allow a current to pass. However, you should only perform this task yourself if you have the skills and knowledge to do so safely, taking precautions such as disconnecting the oven’s power supply. If you have a pilot flame, you can remove the bottom oven plate to check it yourself. If it has its own igniter, you can troubleshoot this using the methods above. If it should be lit using a match, do so carefully and watch for a flame. If the flame is low or inconsistent, the gas release hole may be dirty or obstructed. If there is no flame or a low flame, the valve may be faulty. If there is a problem with the door of your oven, it could let out the heat, preventing the interior from heating. 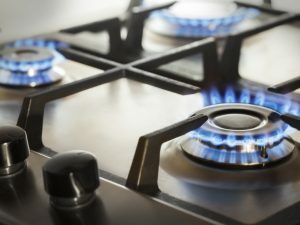 Provided your ignition systems and gas flow are working properly, this could be the reason your oven is failing to heat. Check to see whether the components of the door are damaged. There may be an issue with the door hinges or closing mechanism. If you need to replace these, make sure to obtain the correct parts for the make and model of your oven. Another issue that could cause the heat to leak from the oven is its gasket. A loose or broken gasket will fail to seal the door properly, and the heat could escape with no apparent cause. Inspect the gasket carefully to see if it is loose, corroded or broken. The gasket might be attached to the oven itself, or to the door. Depending on the model of your oven, this may be easy to remove and replace yourself. Some ovens, however, may require the door to be partially disassembled in order to remove the gasket. If your temperature sensor is broken, this could affect the way your oven is heating. You can determine whether this is the case by using an oven thermometer to test the temperature yourself. Compare your results to the sensor readings for accuracy. If the results are incorrect, check the position of the sensor. If it is touching the wall, it should be repositioned, as this affects the sensor’s ability to read the oven’s temperature. If it is already positioned correctly, it is possible that it needs to be replaced or adjusted. You may be able to make an adjustment yourself, or you might require the help of a professional.